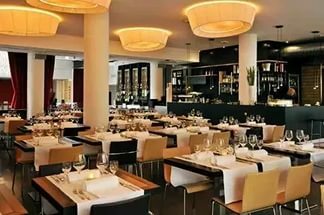 Stuttgart opened in May 1994, and became one of the most prestigious restaurants of the city at once. To win such a reputation in a country with ancient and carefully preserved culinary traditions is not that easy. Stuttgart is a club with a constant and most honorable clientèle. In Tbilisi it is considered a special treat to invite guests to Stuttgart. Famous politicians and businessmen like to be here, this is a place where diplomatic receptions are frequently held. Far off from the St Petersburg family of the Association’s restaurants, Stuttgart offers German, Georgian and European cuisine. Cooking meat and fish dishes the Restaurant’s cooks are really at their best. Cooking in this Tbilisi restaurant is considered unique by true connoisseurs. The Restaurant’s chef is a winner of international competitions and author of various books on cooking. The a la carte menu in Stuttgart is constantly varied, so is the decoration of dishes. Stuttgart is a lively and colourful place. Whoever has heard about Georgia is sure to know that people here are genuine connoisseurs of wine. That is why the real pride of Stuttgart is the Wine List — the largest in Tbilissi. No wonder that booking a visit here should be done well in advance. It is very easy to get here: the Restaurant will gladly have a car sent for you, or even arrange a wonderful real carriage ride along the streets of the old town.